Scheda: Nazione: Giappone - Produzione: Toho Company Ltd., Toho - Distribuzione: Criterion Collection, Toho Company Ltd., Toho International Company Inc. - Soggetto: dal romanzo di Eiji Yoshikawa - Sceneggiatura: Hideji Hojo, Hiroshi Inagaki, Tokuhei Wakao - Fotografia: Jun Yasumoto - Montaggio: Eiji Oi - Scenografia: Kisaku Ito, Makoto Sono - Musiche: Ikuma Dan - Formato: Eastmancolor - Durata: 104'. Cast: Toshirô Mifune, Koji Tsuruta, Mariko Okada, Kaoru Yachigusa, Michiyo Kogure, Mitsuko Mito, Akihiko Hirata, Daisuke Katô, Kuroemon Onoe, Sachio Sakai, Yu Fujiki, Machiko Kitagawa, Eiko Miyoshi, Eijirô Tono, Kenjin Iida, Akira Tani, Ko Mihashi, Kokuten Kodo, Yoshifumi Tajima. Plot Summary, Synopsis, Review: entertainment.msn.com - tvguide.com - blockbuster.com - IMDb: «After years on the road establishing his reputation as Japan's greatest fencer, Takezo returns to Kyoto. Otsu waits for him, yet he has come not for her but to challenge the leader of the region's finest school of fencing. To prove his valor and skill, he walks deliberately into ambushes set up by the school's followers. While Otsu waits, Akemi also seeks him, expressing her desires directly. Meanwhile, Takezo is observed by Sasaki Kojiro, a brilliant young fighter, confident he can dethrone Takezo. 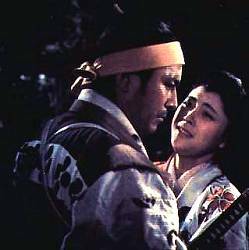 After leaving Kyoto in triumph, Takezo declares his love for Otsu, but in a way that dishonors her and shames him. Once again, he leaves alone». 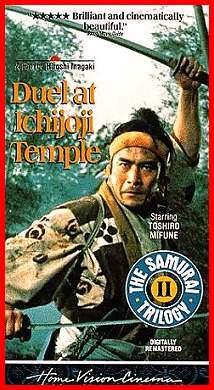 Conosciuto anche con i titoli: Duel at Ichijoji Temple; Ichijoji no ketto; Musashi Miyamoto Sequel: Duel at Ichijoji Temple; Samurai (Part II); Samurai 2: Ichijôji no kettô; Swords of Doom; Zoku Miyamoto Musashi. 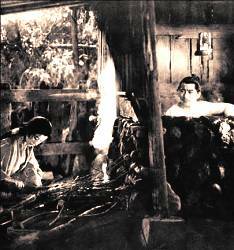 La trilogia di Hiroshi Inagaki sul personaggio di Miyamoto Musashi: Samurai 1: The Legend of Musashi (1954); Samurai part II: Duel at Ichijoji Temple (1955); Samurai 3: Duel At Ganryu Island (1956). 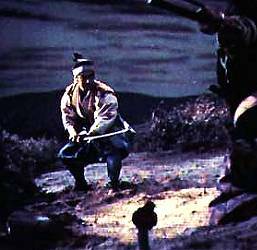 Vedi anche Samurai, di Kenji Mizoguchi (1944).